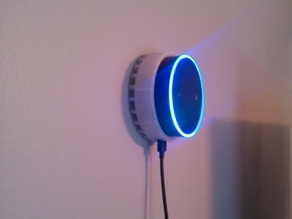 Printed great...but it is a challenge to get the Echo out...if it were mounted to the wall, I'm not sure I could get it out. It printed pretty good without supports, just would require a little cleanup. Haha, yea its a very tight fit. I'm able to get mine out by using a small flat head screwdriver and prying the base up slowly. I've never had any issue with scuffing or damaging the echo. Yeah, if I had it mounted that would be the best way! I pushed an allen key through the four holes to get it moving up. Thanks for the design!